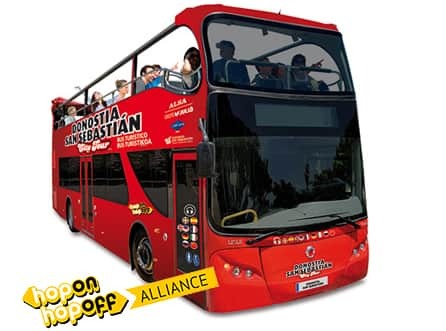 Donostia-San Sebastián City Tour boasts a fleet of buses designed expressly for urban guided sightseeing tours. They travel at a maximum speed of 25 km/h. Our buses have a canopy in case of rain, panoramic windows that provide easy visibility for all passengers and TFT screens with information about different places on the tour. The bus offers an individual multilingual audio guide in 8 languages: Basque, Spanish, English, French, German, Italian, Russian and Chinese. Each of our buses has the capacity for 67 people and a space adapted for people with reduced mobility. They offer information about different places on the tour and the various excursions that you can purchase from our Donostia-San Sebastián City Tour office. Space designed for persons with reduced mobility. 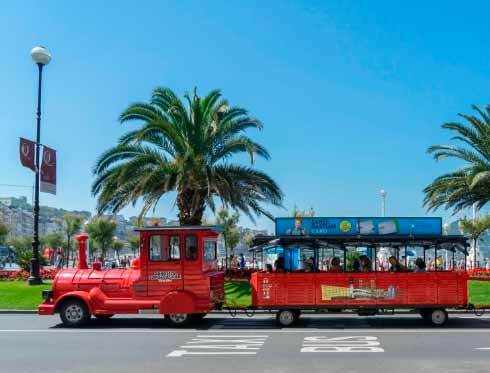 The vehicle, an articulated train with two carriages, has screens in case of rain, panoramic roofs in all carriages provide easy visibility for all passengers and TFT screens with information about different places on the tour and the various excursions that you can purchase from our Donostia-San Sebastián City Tour office. It travels at a maximum speed of 25 km/h. Our train has an audio guide service available in 8 languages: Basque, Spanish, English, French, German, Italian, Galician and Catalan. Our train has the capacity for 54 people and a space adapted for people with reduced mobility. The vehicle has screens in case of rain and panoramic roof in all carriages providing easy visibility. Welcome to Donostia-San Sebastián and welcome to Donostia-San Sebastián City Tour, the best way to discover the gems of San Sebastián. Our bus and train route will take you around the must-see areas of this beautiful city, where the sea and the mountains are always a few steps away. San Sebastián boasts a great quality of life, world-famous gastronomy, beautiful architecture inspired by the French Belle Epoque at the end of the 19th century, as well as numerous gardens, parks, beaches and lively avenues. 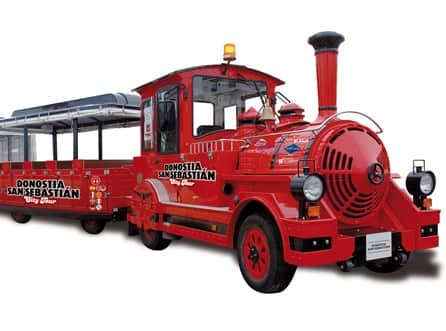 The tour on the Sightseeing Train lasts approximately 40 minutes and the Sightseeing Bus tour lasts approximately 1 hour. Thank you for choosing Donostia-San Sebastián City Tour, where together we will enjoy the beauty of the city and a comfortable ride. 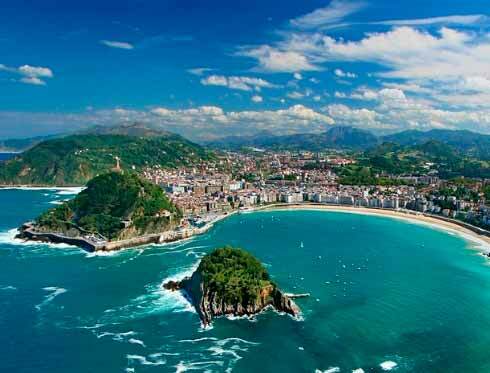 Explore San Sebastián with the official tour bus. 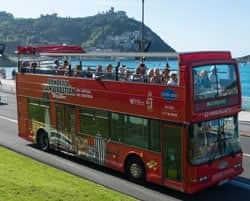 Discover “The Pearl of the Cantabrian Sea” with the Donostia San Sebastián City Tour and enjoy our Hop-on Hop-off service, which lets you get on and off as often as you want at any stop along the route. Take advantage of this service to discover the places of interest on the route. The tour bus route is designed to let you experience every last detail of this magnificent city. 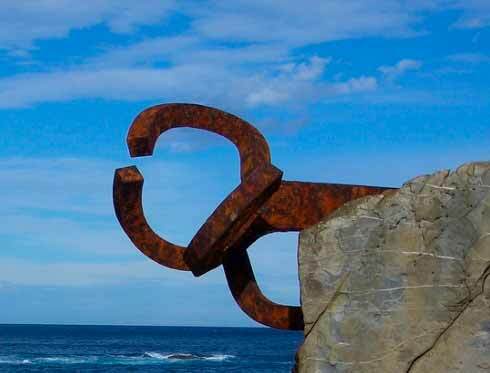 The Donostia San Sebastián City Tour will take you to the most important sightseeing spots, from the Paseo Nuevo, home to the Aquarium, to the Plaza del Funicular, where you can visit Chillida’s famous sculpture “Peine del Viento” or climb to the top of Monte Igeldo and enjoy its theme park. Both services have audio guides available in 8 languages (Basque, Spanish, English, French, German, Italian, Russian and Chinese for the bus and Basque, Spanish, English, French, German, Italian, Catalan and Galician for the train). Simply select your language and you can listen to the guide throughout the tour. -From 1st to 6th January, every day. -From 4th to 17th November, every day. -From 20th November to 31st December, every day. Departures: 10:30am, 11:45am, 1pm, 3:15pm and 4:30pm. Every day from 15th March to 12th April, from 24th April to 30th June and from 1st October to 3rd November. Every dayrom 13th April to 23rd April, from 1st to 31st July and from 1st to 30th september. Departures: 10:15am, 11:00am, 11:45am, 12:30pm, 1:15pm, 2:30pm, 4pm, 5:30pm, and 7pm. From 1st to 31st August. Departures: 10:30am, 11:15am, 12pm, 12:45pm, 1:30pm, 2:15pm, 4pm, 4:45pm, 5:30pm, 6:15pm, 7pm and 7:45pm. From 1st to 6th January, every day. From 4th to 17th November, every day. From 20th November to 31st December, every day. Departures: 11:00am, 12:00 am, 1pm, 2pm, 3pm, 4pm and 5pm. - From March 15th to 12th de April, from 24th de abril to June 30th and from October 1st to November 3rd. -From April 13th to April 23th and from July1st to September 30th. Departures: 10:30am, 11am, 11:30am, 12am, 12:30, 13:00, 13:30, 14:00, 15:00, 15:30,16:00, 17:00, 18:00, 18:30,19:00, 19:30, 20:00 horas. *San Sebastian City Tour offers an uninterrupted service fron train and bus throughout the year, except for 20th January, 10th November, 24Th November and 21st December. You will be given an information brochure when you get on one of San Sebastián City Tour vehicles. In it you’ll find a map of San Sebastián and more detailed information on the stops along the routes.